Melbourne’s ports and docks were frequently criticised by new arrivals. The insufficient infrastructure at her ports was a sticking point for many years. Tickets to Port Phillip Bay did not always include the unloading of cargo and transportation up the river to the Melbourne. Lighters - barges that could navigate the shallow Yarra - would charge passengers exorbitant rates for the trip. Some who had brought cargo to sell on the goldfields found that they paid as much for this as they had paid for their ticket from London. With relatively little money to play with (the colony was supposed to be financially self-supporting) Lieutenant Governor Charles La Trobe had to deal with the high price of labour for any public works scheme. Manual labourers for roadworks had to be well-paid or they would simply desert for the goldfields. All about was strewn the debris of transient occupation: cast-off clothing, old boots, broken furniture, cooking pots and a brewery-load of bottles. 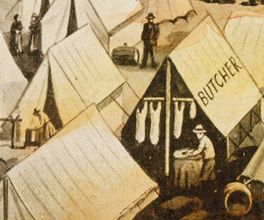 The rows of tents formed ragged streets which, according to one who saw them, were better signposted than their Melbourne counterparts […] The tents themselves came in all shapes and sizes, some of them made to order, others improvised out of bedding and old clothes. Annear, R 1999, Nothing but gold: The diggers of 1852, Text, Melbourne, Vic. Eventually boarding houses (run by charities and the colonial government) would absorb the Canvas Town population. But La Trobe would be remembered for more than just the supervision of thouands of temporary visitors. In 1854 work began on the Public Library (now the State Library of Victoria). Along with his Surveyor-General Robert Hoddle, La Trobe reserved land for parks and future public buildings like Parliament House. He also oversaw the growth of new Melbourne suburbs and regional towns and the installation of gas lighting, the telegraph and gravity-fed drinking water. The first paroxysm of success and excitement is gone off. The diggers have ceased to have handfuls of money to throw away [...] The water of the Yarra, saturated with the filth of the town, is to cease to poison the people. Pure and excellent water from the river Plenty […] The Gas Company promises to light up the streets of Melbourne in another six months as well as those of any English town: and coal of excellent quality is ready for the getting [...] The electric telegraph, already working between Melbourne and Williams Town, will soon be extended to the Heads. The railway from Melbourne to Liardet's Beach is complete, and only awaits the arrival of engineers and carriages from England. Howitt, W 1855, Land, labor and gold, or, Two years in Victoria: with visits to Sydney and Van Diemen's Land, Ticknor and Fields, Boston. Periodic droughts removed the essential ingredient of water from the goldfields. Just as unsuccessful diggers would return to bring in the wheat harvest or shear sheep, so tradesmen would return to the city. In this way, Melbourne grew in fits and starts. While many of the grandest buildings would be completed and renovated by later governors, La Trobe and Hoddle ensured that Melbourne would become a city that reflected the riches of the surrounding land. Beneath the soil of Victoria were the biggest and purest nuggets ever discovered. In New York, the Piersons joined American, Canadian, German and English men and women on a 4 month voyage to Australia. Gold is one of the most desirable elements on Earth. How it is formed and where it is hidden has fascinated people for millennia.